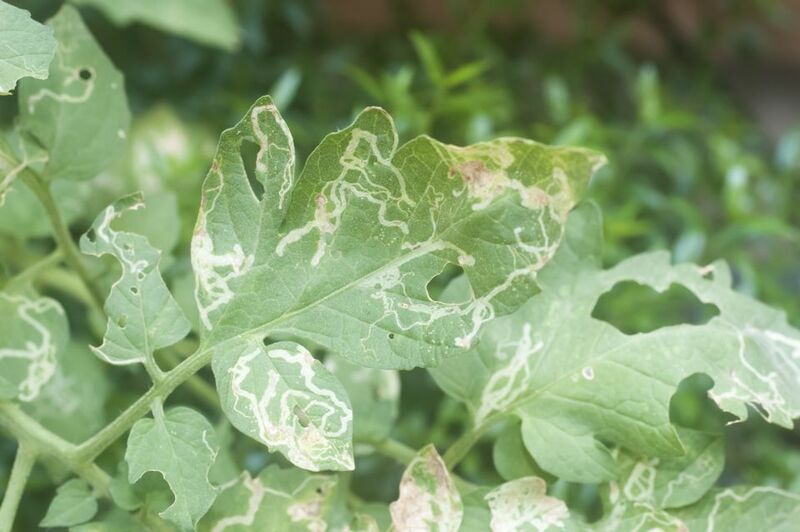 If your plant leaves look like someone was doodling squiggly lines, you have leaf miners. Leafminers are the larvae of various beetles, flies, moths, and sawflies. The adult lays their eggs on the leaf and the larvae burrow into the leaf and tunnel through it, feeding and leaving a transparent trail of where they've been. If you look closely, you can often see a dark dot at the end of one of the lines. Not all leafminers zigzag their way through leaves. If you see a similar whitish transparent blotch, this could also be a leaf miner. Blotchy leafminer damage is often mistaken for some type of disease. The photo here is an okra leaf, but many plants are attacked by leafminers. Columbine is almost guaranteed to have a few, if not several leaves showing the classic squiggly line damage. Plants in the spinach family, like Swiss chard and beets, are also favorites, but leafminers will also feast on cucumber, celery, eggplant, lettuce, pea, potato, and tomato leaves, Yes, that's pretty much everything in the vegetable garden. They will even chew their way through tougher shrubs and trees, like boxwood and citrus. The damage is rarely severe enough to kill the plant unless there is a severe or repeated infestation that could stress the plant and weaken it, though it is certainly unsightly. In the case of vegetables grown for their leaves, like spinach, lettuce, chard and beet greens, leafminers can mean the total loss of a crop. Insecticides are rarely recommended to control leafminers. Since the damage is mostly cosmetic, the remedy is to remove the affected leaves. This does more than improve the appearance of the plant. It also gets rid of the existing leafminers before they become adults and lay more eggs. Since the tunnels throughout affected leaves are dead tissue, it does little good to keep them on the plant. They will not improve in appearance. If you know that a certain plant is susceptible to leafminer every year, you can target the adults before they lay their eggs, by spraying early in the spring with an insecticide such as neem. There are some systemic insecticides, pesticides that are absorbed by the plants and that spread throughout the plant's tissues, that are labeled for use on leafminers. However, most of them are quite strong and some, such as those containing the ingredients acephate or imidacloprid, are being banned in many areas. There are no systemics currently available for non-commercial use on edible plants. The best way to control leafminer damage is to watch for symptoms and catch it early, while you can remove the affected leaves and not have it spread any further.